I stopped by a bookstore in search of my idol Jack Bishop's new, seasonal vegetarian cookbook (which was not there, alas), but I did discover that my greatly beloved Donald Westlake has given the world another Dortmunder novel. I actually thought to myself, "It's a good thing I didn't kill myself last week." Pinning my life to Donald Westlake publications is not a good strategy, however, given that the man has got to be pushing one hundred. (A perennial item on my to do list is "Write Donald Westlake before he dies", which hopefully is a very, very long time in the future, but still, I should get a move on that, as well as "Find new dentist and make teeth-cleaning appointment", which is becoming a perennial). It was not just sheer joy in the bookstore, however. This bookstore has branched out into carrying the seductive Melissa & Doug line of toys, and Lola was quite insistent upon getting a magnetic dress up princess (a sturdier sort of paperdoll, with magnets instead of little tabs). I refused to drop $20 on this when we already have analogous toys at home, but I did spring for another nauseating volume of My Little Pony pablum for her. So: the joy of Dortmunder is counterbalanced by the angst of being compelled to read aloud the doings of the My Little Ponies over and over again... and by Lola's pointed reminder that "I am getting that Princess dress toy for my birthday", spoken in a firm, no-nonsense voice as we walked to the car. i'm a hello kitty kind of guy myself. I've been reading your blog for a few weeks now, going through the archives a bit, and just wanted to say you crack me up! Thanks for having a presence on the web. i cannot resist the lure that Melissa & Doug so strongly resonate. Your bookstore is stiffing you if they're charging $20 for the M&D dress up princess. I think I can get it for you for $10 at several stores within easy reach of me and my little shoppers. The trick, of course, is getting it without my little shoppers demanding something too. And then getting it up your way. HA HA HA! HERRY FALWELL DIED!! i'm a litty drunk from celebrating. Melissa and who? My simple little man has yet to venture off far beyond Thomas.Someday, I'm sure ... but thankfully not yet! 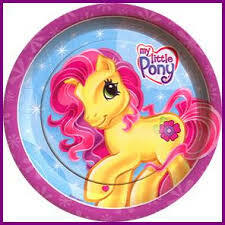 I know it's a bit random, but the man who originally designed (invented) My Little Pony is a friend of mine. Sadly as he was simply an in-house designer, he got none of the money. He now lives in a seaside town and makes wooden moveable toys and wire and bead chandeliers. He's a very sweet retiring arty person - and he always laughs embarrassedly when someone lets slip his claim to (non)fame. "why I don't blog" by the formidable Lemonjuicer! "I can dream about wearing them"